Knitting is a corner stone of Estonia folk culture. Many items of the traditional folk costumes were knitted: including gloves, mittens, jackets, caps, socks, and stockings. The Crusade period provides a likely explanation for knitting’s appearance in this northern land so early on. Upon their return from Palestine, the knights were looking for land in the Baltic region to settle, and they brought craftsmen and servants with them who, in turn, carried with them the knowledge of knitting. The oldest known knitting in Estonia prior to Peets’s find was discovered in a burial site in 1936, along with coins dated 1667. 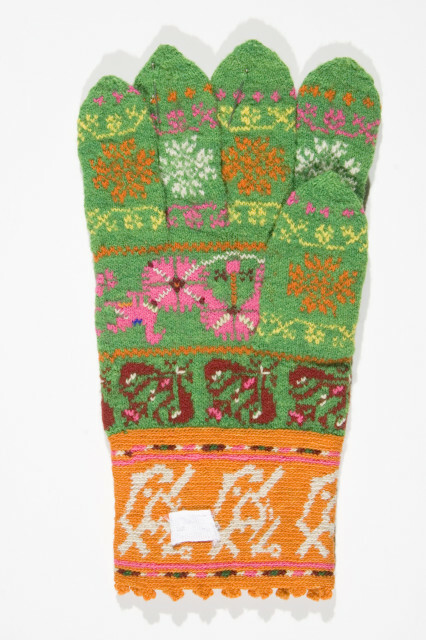 These fragments of knitted mittens are decorated with some pattern knitting, indicating that skilled two-color knitting was practiced at that time. Prior to the introduction of knitting, hands and feet were protected from cold with strips of hide, cloth, or fabric created with the primitive technique known as knotless netting, needle looping, or nålbinding. 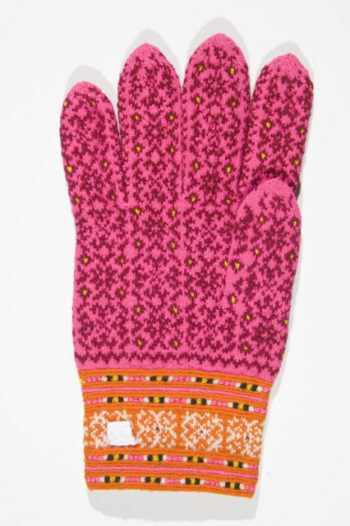 Needled mittens were created with a special needle. Already in the Bronze Age people in Estonia knew how to make them. After completing the needle looping, they were felted to make mittens more cold resistant and that way they also did not unravel. 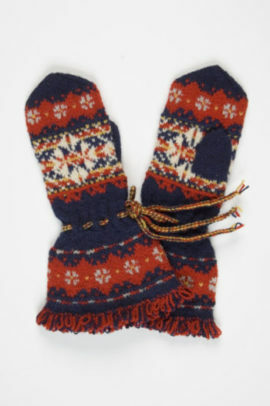 Needle looped mittens were commonly made in Estonia as late as the nineteenth century, when the skill finally vanished. They were last used as part of the wedding customs: layed on the bride’s dowery chest they were hoped to bring protection from the evil eye. One reason needle looping disappeared when knitting became popular is knitting’s continuous yarn flow which saves the worker from stopping and splicing so often. Another difference is the fabric structure. Knitting can be ripped out easily, whereas needle looped material is difficult to take out. Knitting became an important part of the Estonian textile craft by the eighteen century. A.W.Huppel’s book from this period emphasizes the knitting among the necessary skills for any housewife and notes that young girls should be able to knit by the age of ten. A typical Estonian woman’s costume had a pocket for carrying knitting. They were usually separate bags attached to the outside of the costume or worn hanging from a strap. On the mainland, most knitting was done during the cold season, after the fieldwork was finished. On the islands, knitting was done all year around, while walking, waiting for returning fishermen, or even cooking. Some of the most important Estonian knitted items were hand coverings, first mitens, then, by the eighteenth century, gloves. The great importance of these items may be based on Estonia’s northern climate, and may also reflect their use in folk traditions. Mostly mittens, gloves and socks were knitted in, later came sweaters, shawls and hats, but not in such great quantities as mittens, gloves and stockings. Doing daily work outside a person needed many pairs of mittens in winter. In freezing weather some were worn over the others, and one could wear out several pairs during a long winter. Up to the middle of the nineteenth century, when aniline dyes were introduced into Estonia, dyes were created from plants, bark, and moss. Red came from field madder or goose-straw roots. Birch leaves, yellow daisy, or chamomile were used for yellow and maple leaves and heather made green. Brown was extracted from pinecones, alder bark, buckthorn, or cowberry stalks. Blue was the hardest color to achieve; the indigo used to make blue came from India or Africa, was expensive, and was therefore used in small amounts. Indigo blue was known as cobalt blue or pot blue. The woad plant also yielded a blue dye and was much more available than indigo; it was known throughout Europe and Scandinavia and was used for blue prior to and even after indigo became available. Cobalt green or pot green was obtained by first dying yarn green, then over-dying it with indigo. Another imported color was insect red or cochineal. Most of Estonian mitten designs are geometrical. Plant and animal designs are rather rare and are found mostly in Western Estonia, island of Muhu, where bold aniline colors were used in knitting and in folk costumes. The geometrical elements – dots, squares, stars, crosses, and triangulars – found on most knitting are taken from traditional folk designs. 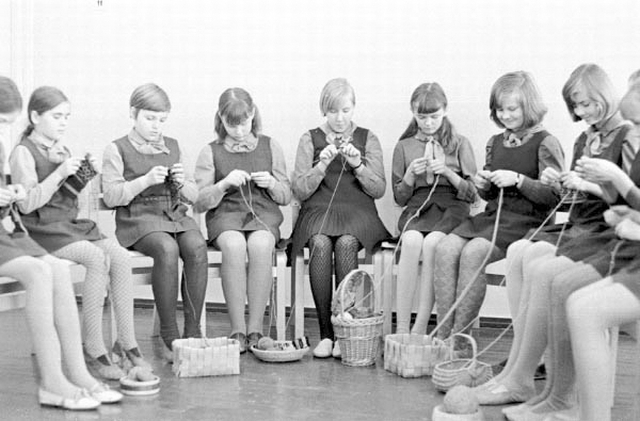 Students in Estonian schools all learn to knit. For most girls it is not the first time they are introduced to the knitting needles. They already know how to knit because of their mother or grand-mother had taught them.